This is the anime classic that started it all. All that Tenchi Masaki wanted to do was to find out what the monster in the forbidden cave near the family shrine was. Little that he would know that he would unleash a wild and beautiful space pirate who finds him very attractive. After that, a whole bevy of extraterrestrial girls show up to complicate his life. Soon afterward, he would find out that his very destiny would be tied to these girls as he finds out that he has strange and wonderful powers - which is what he needs if he is to save the Earth. Tenchi Muyo! is an action/comedy based around Tenchi Masaki, a high school student. The story originally spans along 13 very funny and lovable OVA and continued as a TV series and a movie. 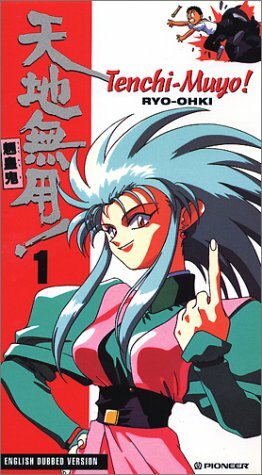 In the OVA, Tenchi accidentally releases the "demon" Ryoko from a cave near his grandfather's shrine in the mountain. After Ryoko realizes who Tenchi really is, (his ancestor was the one who locked her in the cave), she begins to play with or terrorize Tenchi, depending on how you look at it; she's in love with him though. Luckily, Tenchi isn't really a normal guy either -- if he can just figure out why he is not normal, that is. To make matters worse, Ryoko is being hunted by the crown princess of Jurai, Ayeka. Sasami, Ayeka's little sister, barges in and joins in the fun, along with Mihoshi (a Galaxy Police officer- 4th episode) and Washu aka The Greatest Scientist In the Universe aka Ryoko's "mom" (6th episode OVA). Believe me, after this the story starts to get really funny and I just can't have enough of Tenchi and the gang.....AND his grandfather of course...heh. The first OVA series contained 6 episodes, followed up by a 1 OVA special episode. The second and third OVA series each contained 6 episodes, and then 1 final OVA episode was released to tie up the cliffhanger. The above description came from Elwin Blaine Coldiron and Aie's Tenchi Muyó Pages, and was edited by yours truly (contact me).